During his career, Ansel Adams photographed many places, but it was to his beloved Yosemite that he returned year after year and where he made his first expressive images. 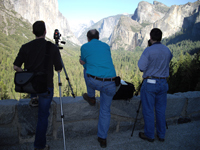 Let Alan Ross show you Ansel’s Yosemite and help you take your photography to new levels of expression, sharing the knowledge and experience he gained by teaching and working alongside the master. No matter whether you work with film or digital, large or small format, this workshop will help you advance your own photographic vision and technique. You will learn to isolate and evaluate the elements of a scene, translate the literal to the expressive, and use optics and exposure to best effect. Visits to many of Ansel’s favorite locations in Yosemite will provide inspiration and insight, with demonstrations, practice sessions and critique laying the foundation for individual photographic advancement. Evenings will be spent on group and individual critique sessions, printing demonstrations, and engaging discussions about identifying and expressing personal vision. A specially designed hybrid darkroom will be available for developing film, scanning negatives, and downloading and processing digital files. 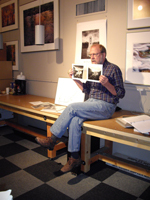 These workshops are offered through the Ansel Adams Gallery. Fee is $1,200 for the week and lodging has been reserved in the Park for workshop participants. These workshops fill quickly. If you’d like to ensure your spot, register now.